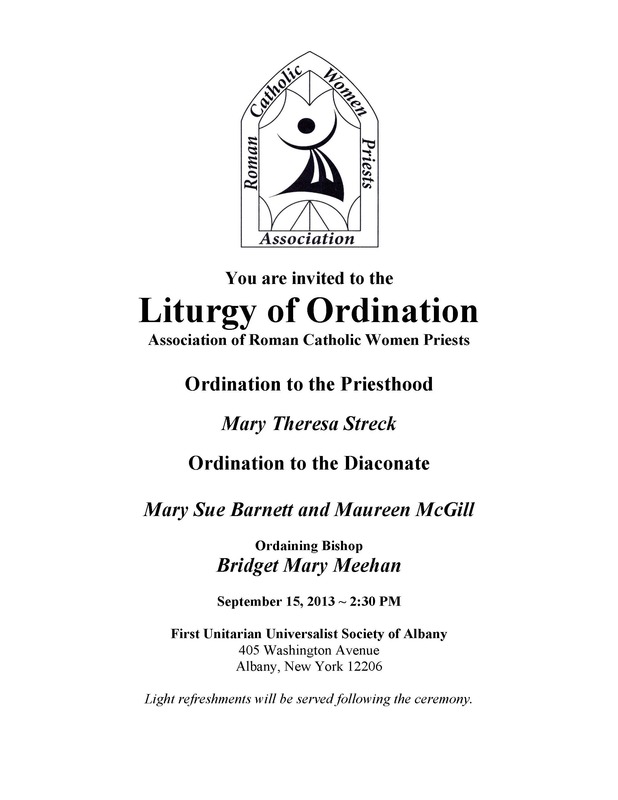 On Thursday, August 8, Fr. 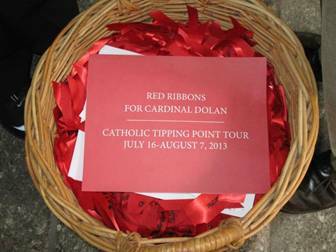 Schuller concluded his tour with the delivery to Cardinal Dolan of the thousands of symbolic Red Ribbons gathered during his speaking events across the country with packed audiences who came to hear him and engage in dialogue. 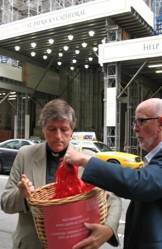 Here are a few photos of his last event: delivering the basket of red ribbons to Cardinal Dolan. 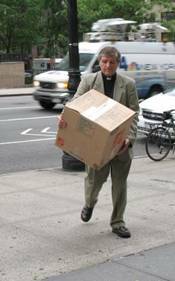 Despite repeated good faith efforts to arrange a meeting with the Cardinal or his designee, no one from his office agreed to meet Fr. Schuller and our representatives in person. So Fr. 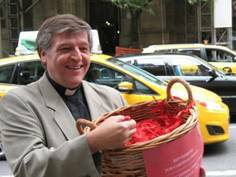 Schuller first went to St. Patrick’s Cathedral and made a videotaped message regarding his tour, and then delivered the basket of ribbons in a large box to the chancery’s office, and included a letter to Cardinal Dolan with his reflections on his tour, which he felt was very positive. Below, the photos and the press statement and the attached (and interesting) city-by-city brief report, and a link to his letter. and Francis Piderit of VOTF NY. moved to meet him in person, especially since it happened by chance. Thanks to all who helped make this tour a success. 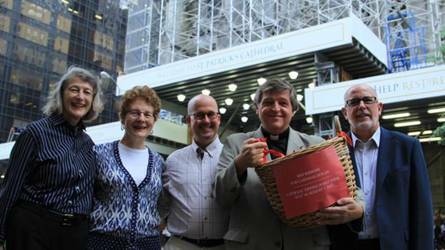 9:30 AM, Binghamton –United Presbyterian Church of Binghamton, 42 Chenango St. (former First Presbyterian Church). 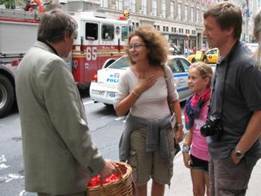 12 Noon Cortland – Grace Episcopal & Holy Spirit Lutheran Church, 13 Court St.
4:00 Utica – DeSales Neighborhood Center 309 Genesee St.